Let me preface this by saying that if you are here to check on the release of the taco, middle finger, hockey stick, or the adorable lion emoji on iOS today; you may be disappointed. Above: Today's iOS 9 emoji update includes additional flags. iOS now has a flags category on the emoji keyboard, keyboard-access to previously hidden flags, as well as 44 new flags included for the first time. This is a modest release compared to the previous emoji update from Apple which brought diverse skin tone modifiers in April 2015, or the forthcoming iOS 9.1 emoji update. 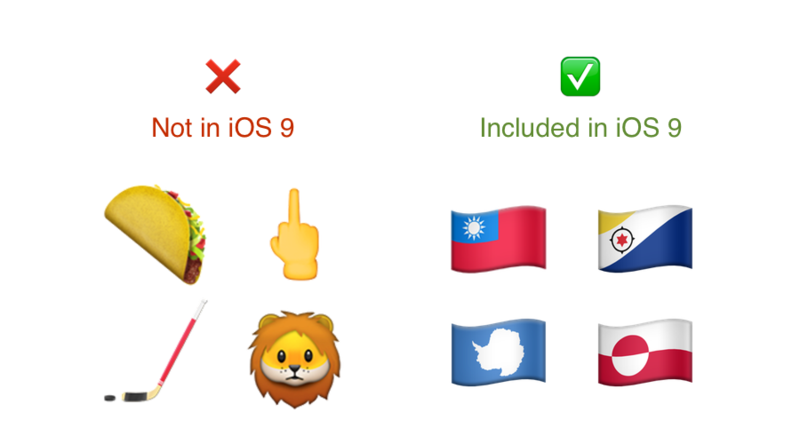 The following flags were supported in iOS 8.3, but not shown on the emoji keyboard. Using these flags previously required a round trip to copy and paste any flags not on the keyboard, or the use of a third party emoji keyboard app. With iOS 9, every emoji which is supported can be accessed directly from the built-in emoji keyboard. iOS 9 adds support for 44 new country and region flags, which have been gone unsupported on iOS until now. Many of these new flags 9 are for relatively small or less populous locations. 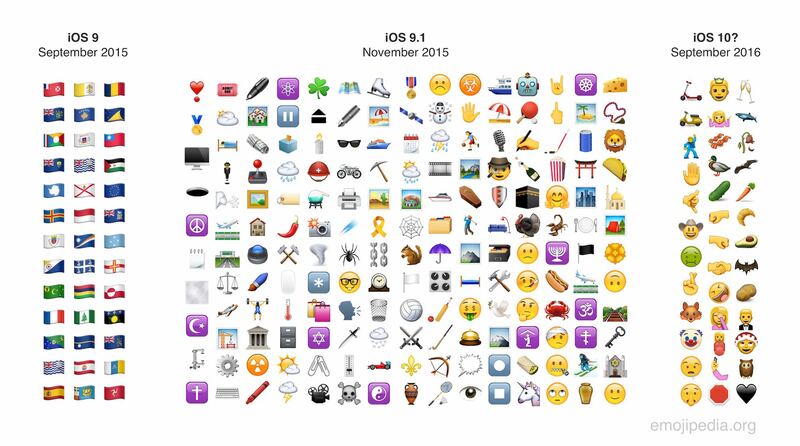 Above: Every new emoji flag in iOS 9. Apple appears to have decided in iOS 9 that it's better to include every ISO_3166-1 country than to pick and choose. Despite the lack of demand for the Flag For Antarctica, for example, it still made the cut. Below is the list of new emoji flags which are supported for the first time in iOS 9. The French overseas regions of Réunion, Guadeloupe, and Martinique all officially share the French flag. However, Apple has implemented these countries by using their locally-used flags in iOS 9 instead. Above: Réunion, Guadeloupe, and Martinique use their local flags in iOS 9. The European Union gets a flag in iOS 9, which is the only non-country (or locality) to have its own emoji flag. This is made possible due to a reservation within the ISO_3166-1 standard which ensures two countries don't use the same two-letter codes. The European Union has the letters EU reserved, making a flag implementation entirely optional, but relatively safe to do so. Above: Flag for European Union is now available in iOS 9. It's odd that the Flag For Taiwan was missing from iOS 8.3, given its greater population than many previously-included countries. Nevertheless, it's now included for the first time in iOS 9. Above: Taiwan gets a flag in iOS 9 for the first time. Unchanged with this release is the situation regarding flags for England, Scotland and Wales. These cannot be included in iOS, as there is no support in the Unicode Standard for them at present. A proposal to allow for sub-regions and countries-within-countries such as these is being reviewed. If this goes ahead in a future Unicode update, Apple will be in a position to include them. Above: A proposal for how sub-regions may gain their own emoji flags in future. The iOS 9.1 update contains over 150 new (and very popular) emojis, and is currently due for release in late 2015, most likely November. Above: Upcoming Emoji Updates on iOS. In addition to iOS 9.1, 2016 will bring the release of Unicode 9, which may see another set of emoji additions in iOS 10 next year. View the list of all emoji flags now. With Apple due to release iOS 9.1 in the coming weeks or months, it's worth noting that the LG G4 handset has supported the full Unicode 7 emoji set since May 2015.